Here’s a familiar story: Microsoft notices a new and important technology market that presents both a huge opportunity and a threat to its core business. The company spends two or three years — an eternity — coming up with an answer. In the meantime, competitors build a seemingly unbeatable lead.Finally, after a lackluster launch, Microsoft contributes hundreds of millions of dollars to a distribution partnership with another laggard. Suddenly, it’s a player — and sooner or later the market leaders feel the heat. This is exactly what Microsoft did in search, and it’s working. Yahoo is out of the search business. Bing is gaining market share. Google is increasingly under attack for the quality of its search results. And Microsoft has bought itself plenty of time to come up with an online services strategy that can beat back Google’s Gmail and Apps. True, Microsoft has lost billions on its search initiative. But that doesn’t matter — it’s an affordable expense to keep the pressure on one of its top competitors. Windows Phone 7 is like Bing: innovative in some key areas, but lagging in others and very late to market. Nokia is like Yahoo: once the market leader, now under attack from all sides. The Nokia deal is like the Yahoo deal: Nokia becomes a Microsoft distributor and essentially gives up on developing its own competing platform, Symbian. Just like Yahoo gave up on developing its own search technology. Google is the market leader and target. In mobile, Microsoft is also trying to take on Apple’s iPhone, but the rise of Android from zero to market leader in less than two years is more threatening. Apple doesn’t really have an enterprise business, but Google wants to turn Apps into a major business. As Android becomes more common in the enterprise, Google can pitch customers on these other services, pointing out how smoothly they work with its mobile platform. This enterprise threat is one big reason Microsoft built Windows Phone 7 to begin with. There was even a similar high-level executive exchange, although this was probably a coincidence more than part of Ballmer’s grand plan. Stephen Elop was formerly the president of Microsoft’s Business Division, but left to become CEO of Nokia a few months ago. Similarly, few months before the Yahoo deal went down, Qi Lu joined Microsoft as president of Online Services — he came from Yahoo, where he helped build Yahoo’s ad platform, Panama. The main difference between Bing-Yahoo and Windows Phone-Nokia is timing. With search, Microsoft was trying to get a deal with Yahoo way back in 2007, but Jerry Yang and Yahoo’s board were against it. 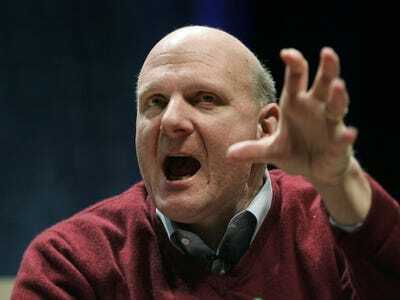 It took a failed acquisition, an economic downturn, and a new CEO before Ballmer got what he wanted. With Nokia, the deal went down much faster. But the basic strategy is the same. We’ll have to wait until 2012 or so to see if it works out as well for Ballmer. big tech bing google microsoft mobile nokia online sai-us search search engine smartphones windows phone 7 yahoo!